It’s not long, though, before she sees the Lincoln that Speed knows: an amiable, profound man who, despite his awkwardness, has a gentle wit to match his genius, and who respects her keen political mind. But as her relationship with Lincoln deepens, she must confront his inseparable friendship with Speed, who has taught his roommate how to dance, dress, and navigate the polite society of Springfield. 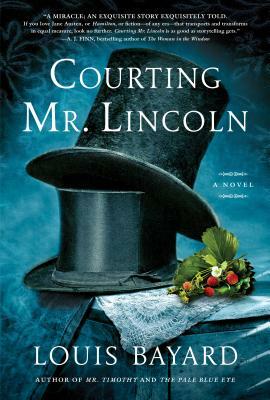 Told in the alternating voices of Mary Todd and Joshua Speed, and inspired by historical events, Courting Mr. Lincoln creates a sympathetic and complex portrait of Mary unlike any that has come before; a moving portrayal of the deep and very real connection between the two men; and most of all, an evocation of the unformed man who would grow into one of the nation’s most beloved presidents. Louis Bayard, a master storyteller, delivers here a page-turning tale of love, longing, and forbidden possibilities. Louis Bayard is a New York Times Notable Book author and has been shortlisted for both the Edgar and Dagger awards for his historical thrillers, which include The Pale Blue Eye and Mr. Timothy. His most recent novel was the critically acclaimed young-adult title Lucky Strikes. He lives in Washington, D.C., and teaches at George Washington University. Visit him online at www.louisbayard.com.